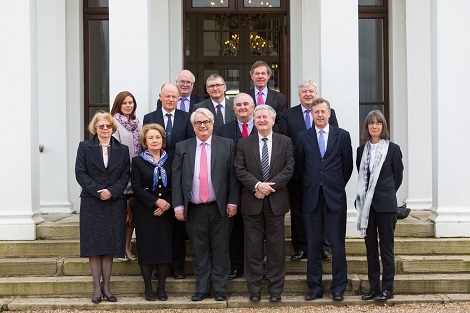 On 5th to 7th March the Supreme Court of Ireland undertook a historic visit to Limerick. It was only the second time the Court has ever sat outside Dublin. The new courthouse in Limerick was officially opened on the Monday evening by the Minister for Justice in the presence of the Supreme Court and the judges sat in the new Court rooms to hear 3 cases over the course of the visit. Members of the Court visited UL and took part in some activities. On Tuesday 6th March, the judges were given a tour of the Munster Rugby facilities on campus and then had lunch with the President. The Judges then held an exclusive seminar on criminal and evidence cases with PhD and postgraduate students from the School of Law. Later the judges were given a tour of the refurbished School of Law and Mr Justice Donal O’Donnell declared the refurbishment officially open in a small ceremony. On Tuesday night, the School of Law co-hosted a dinner in Adare, together with the South Western Circuit and the Limerick Solicitors Bar Association, in honour of the historic visit. On Wednesday at 9 am, Mr Justice O'Donnell gave a fascinating talk on the legal connections involved in the Howth Gun Running. He then had to rush back to the Courthouse for the televising of the much anticipated judgment on the rights of the unborn. Later at 11 am, he returned to UL, joined by colleagues Ms Justice O’Malley and Ms Justice Dunne to hold a unique session with the undergraduate law student population. The judges discussed their reasoning on various constitutional cases including the case on the unborn which they had just decided. The event offered undergrads a unique and rare chance to discuss important legal issues with Ireland's pre-eminent judicial figures - it was a fantastic opportunity to gain an insight into the thinking of Supreme Court Judges as well as a deeper understanding of their role. The visit, co-ordinated by Dr Laura Cahillane, was a huge success and provided further opportunities for engagement with the legal community in general.